This week last year, I got fired from my very first real job. I was 22-years-old, right out of college, and started my first ever 9-5 as a writer for a few national fitness magazines. I had only been there for a number of months when they pulled me into an office on that rainy Monday and told me that they knew I wasn’t happy, and they had no doubt I would succeed at something that I loved, but this wasn’t it and I should get my things and go. In retrospect, it’s totally fair I got fired. I should have been fired. I wasn’t happy. I was constantly sitting at my desk trying to think up my next move. I knew I wasn’t destined to be a little worker-bee for the rest of my life, sitting in a cubicle and making phone calls all day. I knew I wanted to do something that truly filled my soul. So, naturally, I started a blog. I mean, I could write; I had that. Then I started another blog. Then another blog. And I just kept blogging with different logos and names with absolutely no direction, hoping I would just figure it out. And I truly thought that. I spent hours upon hours the next few weeks in coffee shops and parks sitting with my laptop on my lap updating my website, creating a pretty email footer––I had a bad case of the “shiny things” syndrome. I put myself out there, though. “Anyone know anyone who needs anything done? A resume? A wedding invitation?” I charged $20 for resumes and tried to do a few a week for some extra money… and obviously it did not take long for me to realize that wouldn’t pay the bills. Fast forward to a series of unfortunate events––depression and moving unexpectedly. I couldn’t get another real job. I didn’t want to keep writing, but I didn’t have any experience in anything else. I racked up my credit card bills, and many thousands of dollars later, I decided to start waiting tables. I learned and I grew so much as an individual through this time in my life. I graduated top of my class and I was waiting tables, and there is nothing wrong with that. Then one glorious day a few months later I got a phone call for an interview for a Director of Marketing. And another glorious call that I got the job. It was a good job. It was a really good job, working with really good people. But that self-dialogue of mine didn’t care how good it was. 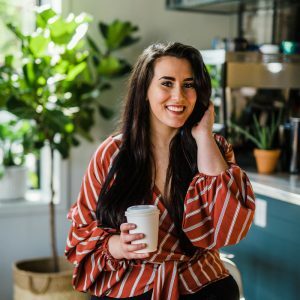 So by luck and a mutual friend, I got connected with my business coach, Jenna Harrison. I was so lost at first. I had no idea what I was doing. I didn’t know what LLC meant, where to start, and oh-my-god what about taxes?! I started out thinking I was going to run a social media business. It’s what I was good at and what others had paid me for in the past. Then I realized it was so much more. My passion lied in the big picture: in branding. After working together and getting that clarity with my business coach, my fiancé got relocated for his dream job in Raleigh, North Carolina (which happened to be where my sister lived.) I successfully negotiated a telecommuting deal with my company at my 9-5, thanks to the help of my business coach. Things were perfect. A fresh start. We knew moving into this apartment that we couldn’t afford it alone if something happened to our relationship. We told ourselves it was never going to be an issue. Until one morning a few months ago, it was. The morning where my entire life and everything I knew had turned upside down. The morning where I had to make the hardest decision I’ve ever made and my now ex-fiancé bought a plane ticket to fly back across the country to go back to Portland, Oregon, while I sat at home with a lot of ice-cream, deleting my wedding Pinterest boards. I had been getting clients and opportunities with my own business were going so well. But throwing in this extra element I was not expecting had me so lost. How could I possibly afford to pay rent by myself? How could I possibly afford the bills, the dog? When would I have time to clean and do everything completely by myself? Then I remember by the grace of God or the universe or whatever you believe in, one of my clients messaged me on Facebook and told me about “hard right turns.” She had heard it in a podcast and it was how whenever something really good is about to happen to this girl, she had to go through “a hard right turn.” She told me that was my “hard right turn,” and I quickly adopted that phrase and spoke it into existence. It was my hard right turn. A week after he left, I put in my notice to quit my 9-5 to pursue entrepreneurship completely. I was able to get 10 months of living expenses saved up in my savings account so I didn’t have to worry about paying the bills. I got dream clients and for the first time in my entire life I wasn’t living paycheck to paycheck. Nine months later… I am free from a 9-5, scaling my business, living alone with my pup and happy as ever. If there is one thing I could take away from my story to tell others it is this: The time will never be “perfect.” Trust me. You could be preparing to take the most calculated risk and something will happen––your dog will need to go to the vet, your car will breakdown; you know how life works. I grew my business more while going through a split with my fiancé, after moving to a brand new city, because once you set your mind to something, the universe conspires to help you get it.